With the popularity of Kyogre thanks to its very powerful Water-type moves, we saw Toxicroak make its mark on the VGC 2019 format thanks to its ability to switch in on Kyogre's Water-type moves like Water Spout for example to regain health. Trouble came for Toxicroak when Tornadus came to be thanks to it being able to threaten it with Hurricane. 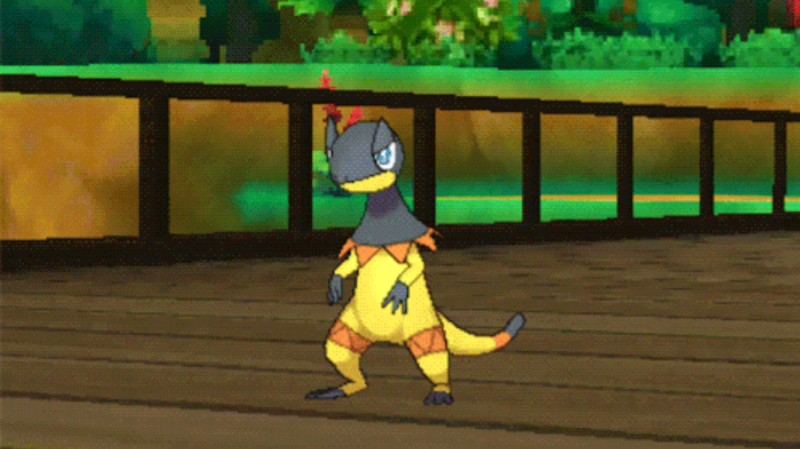 While Toxicroak very much has this problem, Heliolisk doesn't and this article will look at why Heliolisk has a very solid niche in the VGC 2019 Moon Series and how to take advantage of it. As touched on before, the main niche of Heliolisk is its matchup versus Kyogre. This is because of its Dry Skin ability which means it heals 1/4 of its max HP when hit by a Water-type move, heals 1/8 of its max HP each turn in the rain, takes 1.25x extra damage by Fire-type moves, and every turn takes 1/8 of its max HP in damage under the Sun. This means Heliolisk loves being in the Rain since it gains health while it hates being in the Sun due to gaining a weakness to Fire-types. Its 109 base Speed stat means its naturally a very fast Pokémon much like Kartana and Alolan Ninetales, two very fast Pokémon who share the same Speed stat. This means Heliolisk gets a chance to hit Pokémon slower than it for super-effective damage like Kyogre, Ho-Oh, Tapu Fini, and Yveltal for example. Its bulk, on the other hand, is not as strong on the physical side. With 62 HP and 52 Defense stats, Heliolisk will not enjoy switching into even physical hits that it resists. On the specially defensive side, it's 94 Special Defense stat is decent enough to take hits but its weak HP stat brings down its overall bulk. Finally, its 109 Special Attack stat is very good as it means Heliolisk isn't a slouch in the damage department. This means you can rely on Heliolisk as a damage dealer on the special side with super-effective hits but its low bulk makes Heliolisk the textbook definition of a glass cannon Pokémon. This sample Heliolisk set takes its strength as a glass cannon and tries to best take advantage of it. Its EV spread focuses on hitting both hard and fast while not surviving a very long time. Its moveset is very interesting with Thunderbolt as your main attacking option to take advantage of your Electric typing. Grass Knot is your coverage option which means you can threaten Groudon with a super-effective Grass-type move that takes advantage of its massive weight. Your final notable move is Glare, which is a very cool move because like Thunder Wave it can paralyze your opponent but because Glare is a Normal-type move, it can paralyze Ground-type Pokémon. Being able to slow down Pokémon like Groudon and Landorus-Therian, two of the most powerful and popular Ground-types in the format can be very beneficial to making them easier to beat. Another option could be Eerie Impulse which lowers its target's Special Attack by 2 stages. This could be a cool move which if Xerneas successfully uses Geomancy, Eerie Impulse would reset that boost which can make Xerneas much easier to deal with. Assault Vest can be interesting purely due to the fact Heliolisk can learn various other attacks like Thunder, Volt Switch, Electroweb, Hidden Power Ice, and Hyper Voice which can all make very cool options for attacks. The increase in Special Defense can help deal with restricted Pokémon like Xerneas, Mewtwo and Palkia that would otherwise target Heliolisk with one attack and bring it down to its Focus Sash. A niche option could even be Bulldoze paired with Solgaleo since Bulldoze will lower the Speed of every other Pokémon except Solgaleo thanks to its Full Metal Body ability which can activate Solgaleo's Weakness Policy. Life Orb is purely meant to boost your damage output. While it's not the best item compared to Assault Vest and Focus Sash, Life Orb can be a strong alternative if your team really needs Heliolisk but the Focus Sash is taken. Because of Groudon's crippling weakness to Water-types like Kyogre and Ludicolo, Heliolisk can be a very interesting partner. Its Dry Skin ability can make enemy Kyogre a little weary to use Water Spout since Heliolisk will regain health from it and go for a powerful Electric-type move like Thunderbolt or even Thunder to hit Kyogre for a large amount of damage. As touched on very briefly, Solgaleo pairs well with Heliolisk purely due to the option of Heliolisk using Bulldoze to activate Solgaleo's Weakness Policy, giving it +2 Attack. Because Solgaleo has the Full Metal Body ability, its Speed won't be lowered but its opponent's Speed will be, meaning you can use your sky-high Attack stat to wreak havoc. While Heliolisk can support it, Groudon has no trouble beating Heliolisk. Although Grass Knot can be annoying if Groudon can bring Heliolisk down to its Focus Sash in the Sun, Dry Skin's side effect of causing damage in the Sun would take care of Heliolisk's remaining 1 HP. Groudon can use either Precipice Blades or Fire Punch which are both super-effective due to either Heliolisk's typing or ability. Incineroar can be a very annoying presence to Heliolisk thanks to Incineroar's Flare Blitz, which is now super-effective on Heliolisk thanks to its Dry Skin ability. What's more annoying for Heliolisk is, due to its very weak Defense stat, other physical moves in Incineroar's arsenal such as Fake Out, U-turn, and Knock Off can still hurt Heliolisk for a decent amount of damage. Xerneas can set-up pretty easily with Geomancy in front of Heliolisk as long as Eerie Impulse isn't a factor. If Eerie Impulse is present, then the best thing to do is to avoid setting up and take out the Heliolisk. If Eerie Impulse isn't present, however, then Xerneas can just use Geomancy and take out Heliolisk insanely easily. Kartana is notable because it gets access to the Fighting-type Sacred Sword, which means it can hit Heliolisk for super-effective damage. This means Kartana can threaten Heliolisk with a large amount of damage that, if the Focus Sash isn't present, will OHKO. The downside for Kartana is its low Special Defense stat which means Thunderbolt can do a decent amount of damage even though Kartana resists Electric-type moves. The largest and most important to use Heliolisk is if your team is struggling with Kyogre. If Kyogre is giving you some issues either because one of your restricted Pokémon is weak to Water-type moves like Groudon, then Heliolisk can be very helpful as a switch into Kyogre's Water Spout or as an offensive answer to Kyogre depending on the situation. Just keep in mind that because Heliolisk's bulk is very low, you'll want to be aware of when it takes damage to make sure it doesn't go down before Heliolisk does its job. If you can do this, then Heliolisk can potentially become your team's MVP.